Er is een nieuwe versie uit van Stereo Tool. Deze geluidsprocesing kan je in combinatie met RadioDj, Sam Broadcaster en ProppFrexx gebruiken. Het is een goed alternatief voor Breakaway. Marian Trace Alpha on Windows 7: Added workaround to avoid driver hangups, which occurred on some systems after some performance optimizations done in version 7.41. Added 'Flat tops' mode to Multiband Compressor and Natural Dynamics. Added experimental DeLossifier (MP3 artifacts removal filter). So far it only reduces pre-ringing a bit. Sound card control: Added locking to non-ASIO audio to protect buffers. 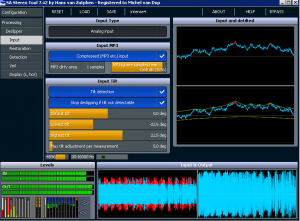 Declipper: Sound at extremely low latencies (256 samples or less) improved. 7.41 bug fix: AM Assymmetry in combination with FM pre-emphasis enabled again. 7.41 bug fix: Deemphasized audio didn't work properly under all circumstances in 7.41, fixed again. 7.41 bug fix: Fixed potential crash due to a rounding error in the compressor in 64 bit VST plugin. 7.41 bug fix: Linux version crashed un startup. Code improvement: Potential rounding error in compressor (which could lead to all kinds of issues) fixed. Code improvement: Initializing some values that were never initialized before. Code improvement: Several 'Division by 0' situations (which were masked so they didn't cause problems) are now completely removed. Perfect Declipper separate product now uses the same code base as Stereo Tool again. Added a lot of new presets. Last updated by M. van Dop at 3 november 2016 .